There are no simple solutions to overcoming the growing violence, hatred and bigotry that infects our world. Yet, each of us has the capacity to resist being pulled down into such an ugly inhumane and dangerous mindset. We are surrounded with opportunities to make a real difference in the world. Every single one of us can reach out and impact someone in need of care and compassion. Will that end the violence and and hatred in the world. No. But, it will keep us human, And it will change the life of the one we have befriended. And that’s a start. 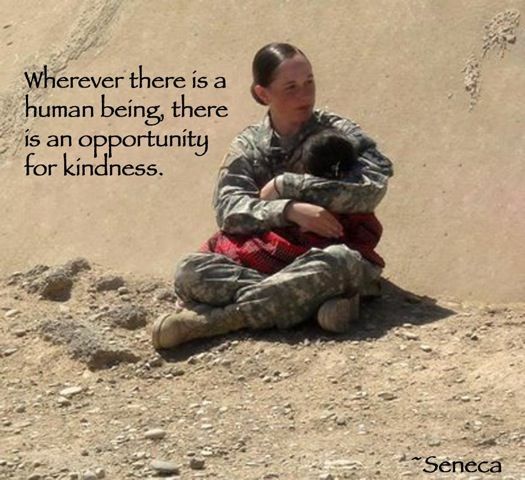 This entry was posted in Hunger & Poverty, News & Views, Quotes and tagged bigotry, caring, compassion., hatred, human family, impact, kindness, love, opportunities, Seneca, solutions, violence on January 6, 2016 by Ray Buchanan.